Humane Touch in the Hills of Sikkim !! I spent the last few days trekking in Himalayan hinterland in Sikkim towards Goecha La with a small group led and organized by WildBoots !! We were 5 days into the trek from Yuksom to Lamune in Sikkim waiting to climb the Goecha La View Points at 15000 ft+ for that sublime view of Kanchendzonga. It was a quiet evening in windy Lamune, all of us huddled into our sleeping bags early on under the vigilant eyes of the Trek Leader(Vikrant- co Founder of Wildboots). Around midnight, one of our fellow trekkers was struck by acute breathlessness and had to be rushed down to a lower altitude. It is a rocky mountainous terrain, with narrow passage ways often just enough to place one foot at a time. Lamune to Thansing was a 2 hour journey through rocks and snow and thankfully; the near full moon connived to shine even more bright assisting them to trudge along. At Thansing, 2 hours away; she started feeling worse and the India Hikes Trek Lead Harsh came ahead offering life saving medicine. He did not for a moment think it was a different group; all that mattered was saving a life and the logical divisions that existed instantly blurred. The local support team of WildBoots; Shwang, Tashi etc swung into action mobilizing people at every level to do the needful. The next 18 hours was a life saving operation; as groups of people came by at each point taking turns to hold her on their back, sometimes on the stretcher as they rushed down in measured steps to 4000 ft+. While people came by did their bit and left; Vikrant trudged along for 18 hours ; sometimes supporting the stretcher; sometimes the oxygen and continuously engaging her in conversation till they wheeled her into the health centre in Yuksom and the doctor took over. 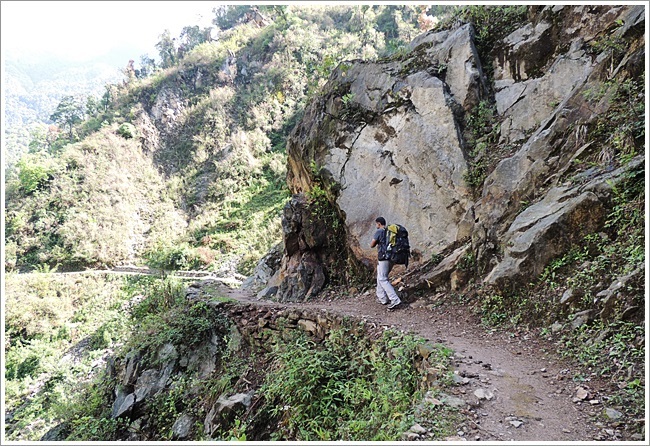 Let me assure you that it is not easy to walk for 18 hours in hilly terrain. At hindsight; it was an impromptu co-ordinated operation. I guess, no management school prepares you for such operations; and no amount of program management skills can see you through. Who is the hero of the operation you may wonder !! Is it Vikrant, is it Harsh; Is it Tashi; is it Shwang; Is it Bob, Rohit, Manoj; or the nameless ones who just came and did their job. Who is it ??? There is none actually; everyone who came forward that day to save a life is a hero. They never knew who they were saving, they will perhaps never know her, but the joy in the eyes of having successfully taken her down to safety taking turns to manoeuvre through the difficult terrain can never be missed. This unconditional effort to save a life is alive in the hills of Sikkim, where you meet a little Buddha with twinkling eyes in every corner. It is the code of the mountain to live through the heart. Note: Please prepare adequately for a trek into the hills and keep track of your clothing, how you are feeling and keep reporting to the trek leads. Do not compel the likes of Vikrant to heroism and expect that everyone will always drop everything on hand and jump into a rescue mission and definitely succeed. Also, it does inconvenience several people in the whole chain who are a part of the group and have their own expectations from the trek. ← Reminiscing my days in Kathmandu, Nepal ! !